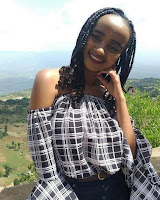 Tuesday, April 9, 2019 - A middle aged man identified as Naftali Kinuthia is in police custody after he hacked his girlfriend to death at Moi Teaching and Referral Hospital on Tuesday morning. Kinuthia accessed the hospital where his girlfriend was doing her practicals armed with an axe and a sword. He had hidden the killer weapons in a sack. He confronted his girlfriend Ivy Wangeci who is a 6th year medical student at Moi University and hit her head with an axe and then cut her neck with a sword. Members of the public were forced to scamper for safety as the man unleashed his wrath on his girlfriend. He is said to have ensured she is dead before leaving the murder scene but he was cornered by boda boda riders who gave him a dog’s beating before police came to his rescue. According to Naftali’s uncle, Mr Jotham Mwareri, his nephew had not shown any strange behavior before carrying out the heinous murder that brought business at the busy hospital to a standstill. “He has all along been very dedicated to his work. We had not seen any strange behavior in him” Mwareri said of the Computer Science graduate who works for a betting firm in Nairobi. An eye witness identified as Benethe Ananda said the suspect was smartly dressed and no one would have thought that he had an ill motive of killing his girlfriend. “He had a white sack. We only heard the lady’s cry later. We rushed to the scene and found her lying in a pool of blood moments later,” She said. Enter your comment...it's so sad.. Bt Moi University should check on security issues.. All campuses are facing this wrath.. It's not fair... We are still mourning our 4th yr student Who was stabbed with a knife in main campus.. Kindly we need help!!! !